Ever heard of the expression; “give a dog a bone”? Well, is that idiom actually sound advice? This is a matter of great debate between dog experts, although they can agree on one thing; that you should NEVER give your pet cooked bones. The debate regarding raw bones is brought on by the fact that raw bones are softer and more digestible, yet many vets can attest to seeing some horrendous bone-related injuries. Fractured teeth that can sometimes be so extensive that surgery like root canal (yes, dogs get those as well) is needed. One of the biggest arguments that those who are pro-bone has, is that dogs are anatomically and physiologically designed to digest raw bones. This claim is then substantiated by the fact that they have strong jaws, large canine teeth and a shorter digestive tract which enables food to reach the highly acidic part of the stomach much sooner. Although all of this is true in theory, they are missing one critical element that changed everything; humans. Domesticated dogs today have been bred into a variety of totally new and docile species and hardly resemble the biology of the wild dogs that once had to hunt and kill for their food. But as any pooch parent knows; dogs love to chew and bones definitely have its health advantages. 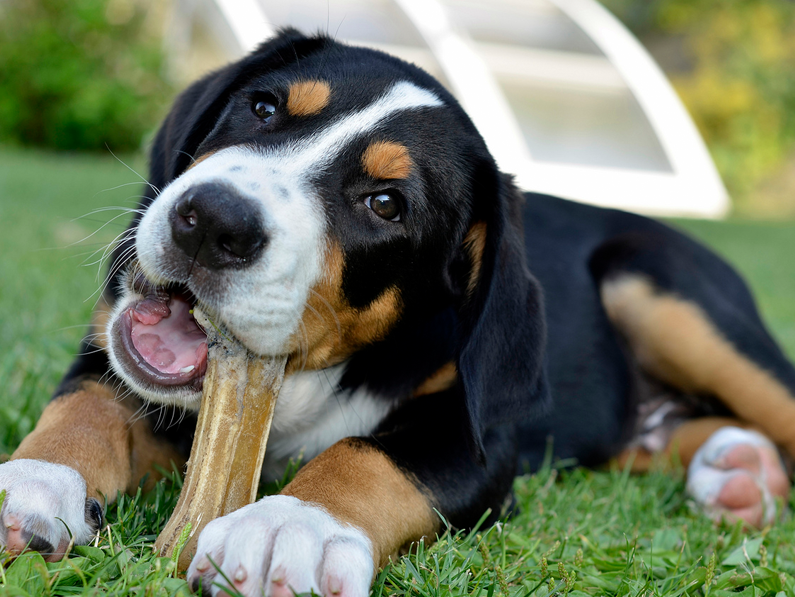 Chewing is not just fun and games for your four-legged friend, it’s instinctively necessary in order to stimulate his jaw and bones are a natural source of calcium and phosphorus. But if bones pose any sort of risk to your pet; why tempt fate? There are safer alternatives that will serve the exact same purpose. Certain dog toys are specifically designed to be chewed and there are plenty of dog treats that serves the same purpose with the added benefit of having all the added nutritional value that you find in bones. But you need to consult an expert first before “treating” your pet, since many popular household brands can lead to excessive weight gain. Animal Hooves or antlers do not fall within the safer alternatives category. These can pose just as much danger as bones. To help you find a safer alternative for your tip top dog, contact TipTop Dog Food here.